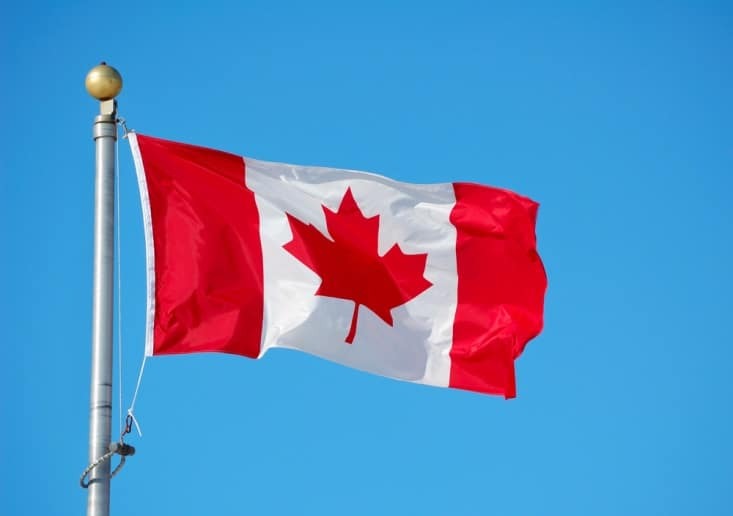 While Americans just can’t get enough of their stars and stripes, we Canadians are undeniably proud of our national flag. The Maple Leaf, or l’Unifolie (the One-Leafed), has only relatively recently become a national symbol for Canada, but it is easily recognized around the world, making it an effective marker of Canadian spirit. Because Niagara Falls crosses the border between Canada and the United States, visitors to the area will undoubtedly see plenty of bright red Maple Leaf flags. Before you leave Niagara Falls, Ontario, be sure to pick up your own Maple Leaf and regale your friends with the story of its creation. Canada has seen several different flags represent its lands since its discovery by the West in 1497. John Cabot (or Giovanni Caboto) was an Italian navigator commissioned by King Henry VII of England to explore the New World in the name of Great Britain; upon landing in Newfoundland, Cabot carried the flag of St. George’s Cross, which is a red cross on a white field. Commonly associated with the Crusades, St. George’s Cross was a “warrior flag,” and while today it is scorned by millions of Europeans, it was the first European banner to be flown in Canada. In 1534, when Jacques Cartier claimed the land for France, he planted in the soil a flag bearing the French royal coat of arms and a fleur-de-lis. While the settlement of New France grew, several French military banners flew over the territory. Meanwhile, after the first English settlement of Nova Scotia began in 1621, the Union Flag of Great Britain (the familiar red, white, and blue striped flag we see today) began to spread throughout Canada. In fact, the Union Jack would become the main flag of Canada for another three centuries. Historians continue to debate when Canadians truly gained independence from Great Britain. 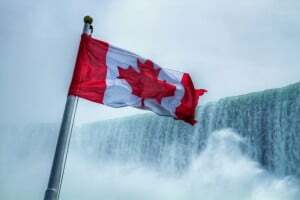 Steps toward complete independence were taken throughout the 19th century, the largest of which was the signing of the British North America Act, which established a disparate parliament and prime minister in the territory. However, Canada and Great Britain maintained a close relationship for another century, and Canada continued to use British symbols, like the Union Flag and the British coat of arms. During this period of questionable independence, several possibilities for the Canadian flag were introduced. An early contender around 1870 was called the Canadian Red Ensign, and featured the Union Flag in the upper left corner of a red field dominated by a Canadian shield, which depicted the quartered arms of Ontario, Quebec, Nova Scotia, and New Brunswick — the most dominant provinces of the time. Significantly, this shield was surrounded by a wreath of maple leaves. The familiar Canadian Red Ensign with a Union Flag and a fleur-de-lis to represent French Canadians. Three red maple leaves between two blue borders. One red, stylized maple leaf between two red borders. While the prime minister preferred the second option, one expert contended that red and white have long been associated as Canada’s national colors — even since the first St. George’s Cross was planted on Canada’s shores. As a result, the committee selected the final flag design, which continues to wave over Canada’s lands, even Niagara Falls, today.